Happy Thursday … wait, it’s only Wednesday. Rats! At least it hasn’t been a bad week. And we’re getting absolutely perfect weather here, bright, sunny, in the 60s with a slight breeze and I can’t complain about that. Or the beefcake I was treated to when I checked the mail. And for once he was kind of smiling! I swear all the feature runners on Runner’s World are never smiling and looking a little too serious and angry. I like this new trend. Something else new I like is sprouted lentils. I decided to try sprouting about 1/4 cup of green lentils I got from the Whole Foods bulk foods section and four days later the jar was almost overflowing. It was simple, just soak the lentils for about four hours, drain and rinse the jar out 2-3 times a day. Four days later, they should be good to go. I didn’t get too creative with them, I just threw a bunch into a large salad. 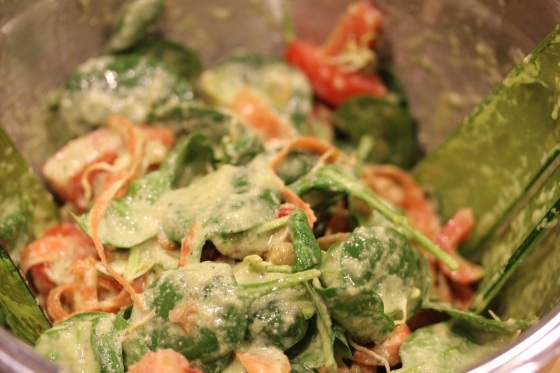 Then coated that salad with the orange cucumber dressing from Ani’s Raw Food Kitchen. And stored the rest in a produce container in the fridge. 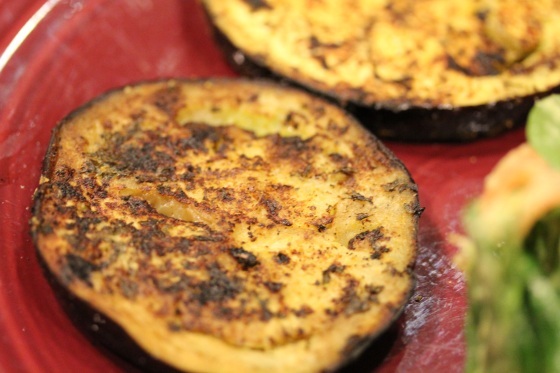 To go with my salad, I sliced an eggplant to pan fry. 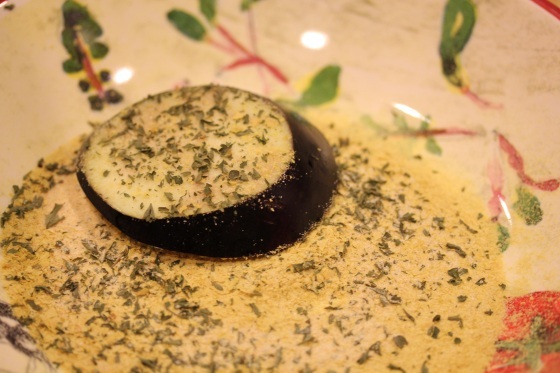 Then coated the slices with a mixture of nutritional yeast, garlic powder, onion powder, pepper, salt and dried parsly. 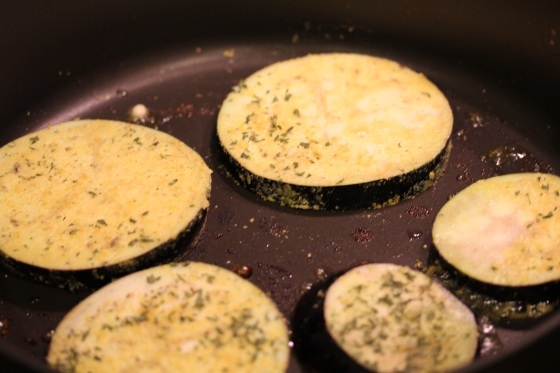 Fried them in a little olive oil until nice and crispy on each side. For a half raw dinner. The sprouted lentils were very tasty, like a “meatier” sprout with a slightly spicy flavor and a firm, but moist texture. Not at all crunchy like undercooked lentils, the texture was great. 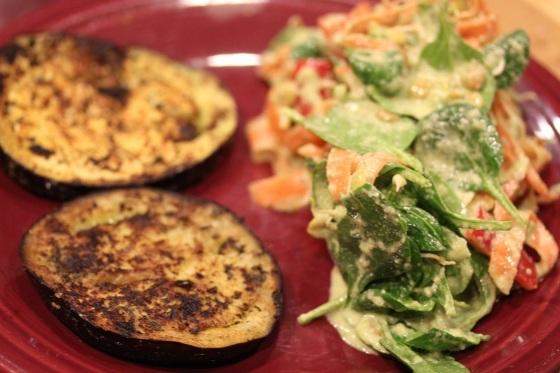 Ani’s orange cucumber dressing was also a hit with me and hubby, next time I might add more ginger. 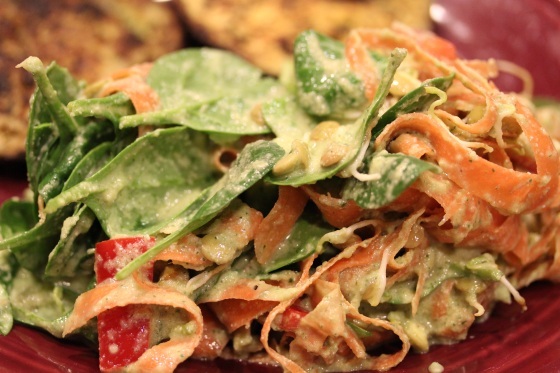 The pureed cucumber in the dressing give it crisp, summery flavor and blends well with the citrus. 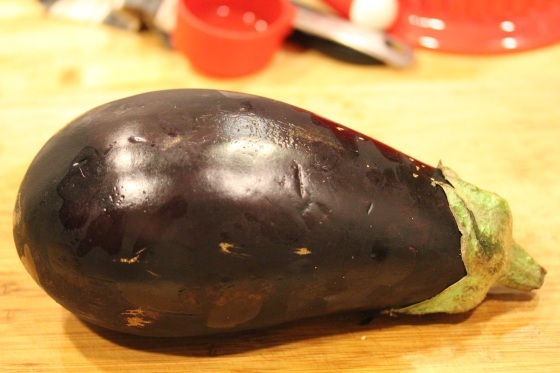 My eggplant experiment actually came out pretty well, nutritional yeast makes a pretty good bread crumb alternative and they weren’t overly greasy or burnt. They were relatively fast and easy to throw together. 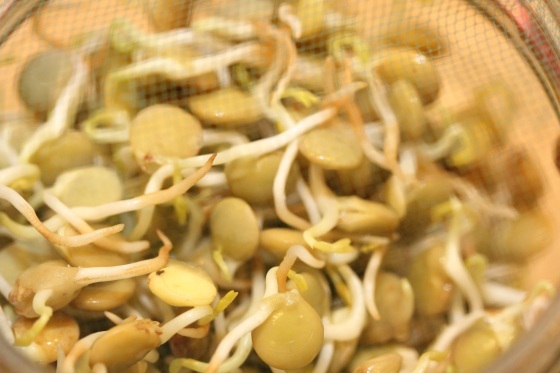 But back to sprouted lentils – try them if you have time to sprout them, they’re a great source of protein and fiber and a fun alternative to eating cooked lentils. Hmmm, what should I sprout next? Sweet, can’t wait to hear what you think. Prime is great, use it all the time for grocery items. 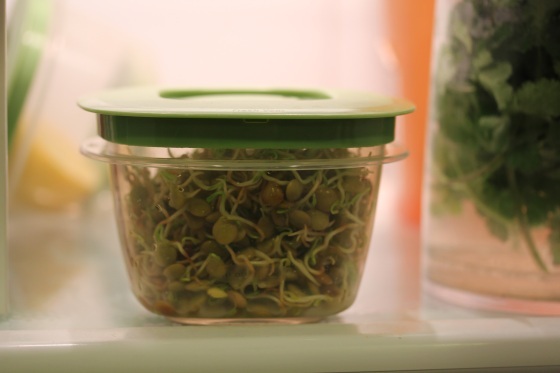 Lately my sprouting efforts have been thwarted by a mold or fuzz growing on my growing sprouts, it usually happens about two or three days into the process. I soak my seeds overnight and then rinse twice a day with cold water and leave inverted in the dish rack to drain in between rinses. I get so bummed to see the fuzz growing on my sprouts and that I have to compost them because of it. Any ideas why I’m getting the fuzz? Has this happened to you? I do occasionally have a fuzz problem and I’m surprised it didn’t happen with this batch since it ended up being so full. It seems to be okay as long as I use no more than 2 tablespoons of seeds in a jar and keep it tilted to the side and rotating it while rinsing out. Maybe you’re using too many seeds? Thanks, I did reduce the amount of seed I was using..I’ll keep trying…it’s such a mystery for me. Have a great day! 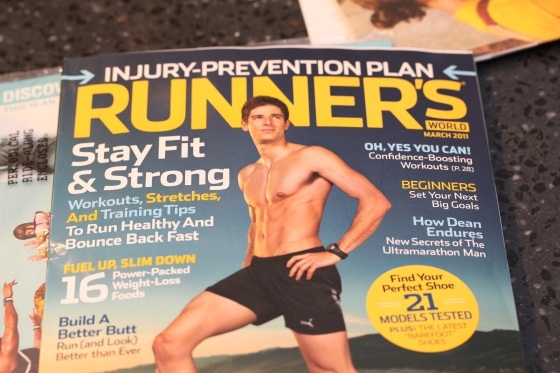 So, random thoughts on the Runner’s World cover. My friend Sam and I had this whole joke about “man thigh” in college and that guy is TOTALLY “presenting his man thigh” in that picture… Just saying. Too funny on man thigh! :-P I’m all for guys showing a little thigh action! 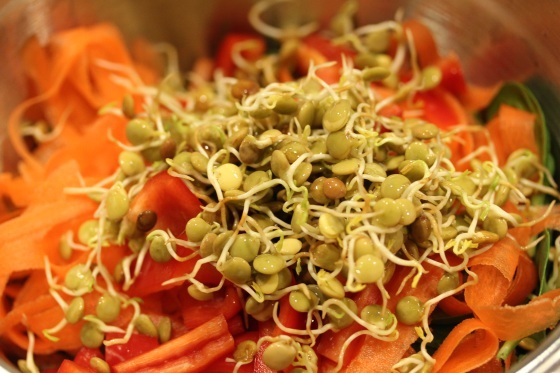 the sprouted lentils…sounds so simple and perfect! and love that the texture is very diff than just an undercooked lentil. thanks for clarifying. wonder if the bag of lentils i have that are Arrowhead Mills would sprout? i guess that’s one way to tell if the food is living or not. Try to sprout it! It’s a great dressing, you should totally try it. NP on the lentils, I will be sprouting a lot more of them for sure. 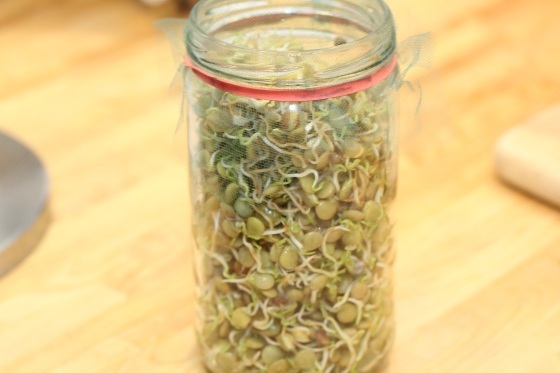 Your lentils should sprout, I used ones from the WF bulk foods section.